I fish a lot. I have my own boat and I often fish in the Keys in my own boat. 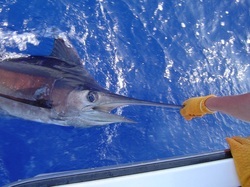 When I have family or business guests in town for a short stay, and we want to go fishing, I fish with Capt. Don on the Kay K IV. Why? Don knows where the fish are and he knows how to catch them. You see, I know how to catch fish too, but its actually a lot of work to get the right live bait and rig everything on short notice for the fish you are targeting at the moment. When the fish are spotted, the crew has to scramble to match the right gear and bait to the fish. It doesn't do much good to hook a 50 pound tuna on a light weight snapper rig. That is where Don and his expert crew earn their keep. Its all about what you can catch and keep. I have boat loads of stories on my own boat about the big ones that got away. Its interesting conversation and speculation about what it might have been, but its way more fun to talk about the great long fight about the big tuna you caught, while you are eating it. Thanks Don for the great fishing trip. I can always count on you for a reliable fishing experience. 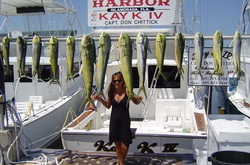 My wife isn't much for fishing, but even she had a wonderful time in the very clean and cool salon. She enjoyed the beautiful scenery and the stable ride of your boat. The snapper and Mahi Mahi that we caught were delicious. Thanks for cleaning the fish for us. We had so much fish that we shared fresh snapper with our friends and neighbors. Thanks again for a great time.